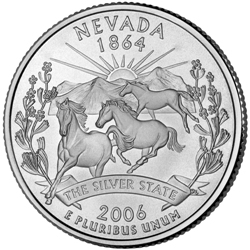 Nevada State Quarters are the 36th variety in a series of fifty design changes over a ten year period from 1999 to 2008. This Quarter was released into circulation on January 31, 2006. The reverse of the Nevada quarter consists of three wild mustangs and a sunrise over snow-capped mountains. Sagebrush surrounds the entire design with the state motto below. Personally, I think this is one of the more striking and beautiful coins of the entire set. The reverse of the coin bears the inscriptions "NEVADA 1864”, "THE SILVER STATE" and "E PLURIBUS UNUM" along with the date of 2006.